Challenging, uncertain economic times accelerate sales cycles and lead to more closed deals for business intelligence software providers. Companies get an urgency to reduce costs and risks, relying on the insights gained from these applications. There’s an interesting dichotomy starting to emerge in how experts and analysts define just how these markets will mature however. Both agree that economic uncertainty are growth catalysts yet they diverge on adoption rates, roadblocks, and which analytics and BI technology will dominate in the years ahead. This week I read Balancing Custom And Packaged Apps In Your Application Portfolio Strategy by George Lawrie, Mike Gilpin and Adam Knoll from Forrester and the latest Hype Cycle of Business Intelligence, 2011 by a collection of Gartner authors led by Andreas Bitterer. I’ve summarized the key points of each below. 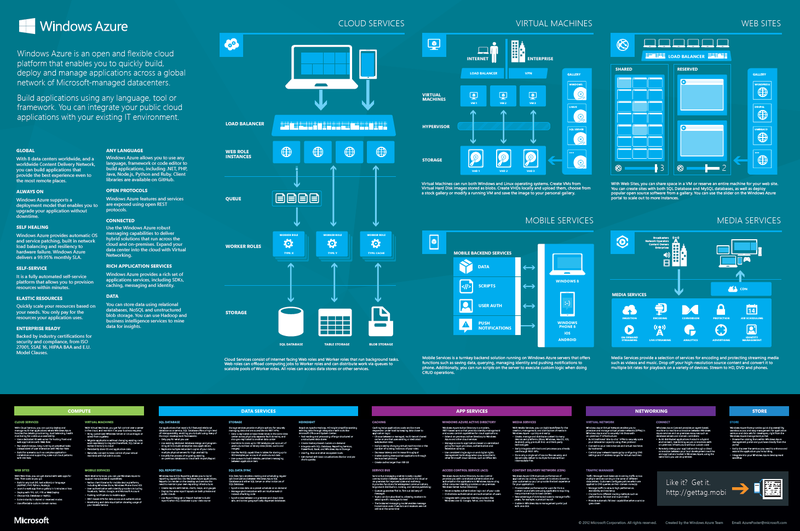 Forrester sees SaaS-based applications starting to replace in-house custom application development, gathering momentum through 2013. 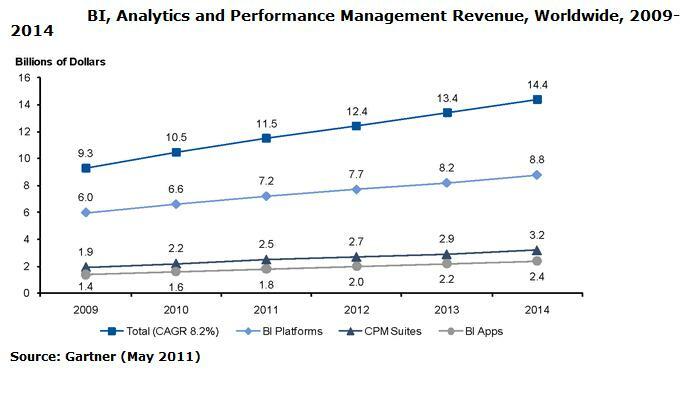 Gartner, with their Hype Cycle for Business Intelligence, 2011 just released this week, shows BI platforms having greater near-term benefit than SaaS-based analytics and BI. Custom application development projects are going to face continued pressure to keep up with business requirements that SaaS applications are proving able to handle more effectively and economically than ever before. 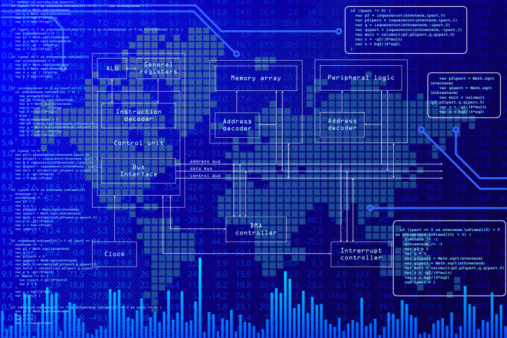 In-house development makes more sense for specific analytics and reporting requirements, yet will continually be eroded by SaaS-based applications that can meet most requirements at a lower cost. Forrester has in the past said SaaS-based adoption of analytics applications in general and predictive applications specifically would be very slow due to data integration challenges. This study points to a potential shift in their mindset, as the data shows SaaS-based analytics beginning to replace custom in-house developed applications. Analytics processes are supported 79% of the time with custom application development. Procure-to-pay (33%) and record-to-report (33%) are the second-most supported. Multiple responses were allowed in the survey. When asked which process areas they are automating with SaaS, analytics (33%), record-to-report (18%), order-to-cash (15%), and purchase-to-pay (12%) were the most common responses. There was a small sample size on the Forrester report and the most startling insight was how quickly respondent companies plan to migrate from custom application development to SaaS-based analytics and BI. Nearly 50% of the respondents to the Forrester survey have between five and 19 SaaS-based applications today with 18% expecting to have 35 or more by 2013. In addition 63% of respondents expect to deploy between five and 34 SaaS-based applications by 2013, a significant shift in just two years. 36% of survey respondents say their SaaS applications run completely standalone. Another 36% mention they use a combination of on-premises Master Data Management (MDM) and process integration tools. Ironically only 3% are deploying their applications on cloud-based MDM or process integration-based platforms. Mobile Business Intelligence (BI) is the latest entry to the Hype Cycle for Business Intelligence based on the massive hype around analyzing locational and application data. The hype surrounding the Apple iPad Series, Google Android and other tablet and smartphone platforms has made this one of the most hyped areas of the last year according to the analysis. Consumerization, Decision Support, analysis of non-traditional data and “Big Data” are the areas of the greatest innovation today. The hype cycle points to search, mobile, visualization and data discovery being the catalyst of Consumerization. Predictive analytics, which is on the Slope of Enlightenment on this latest hype cycle, is critical to decision support. 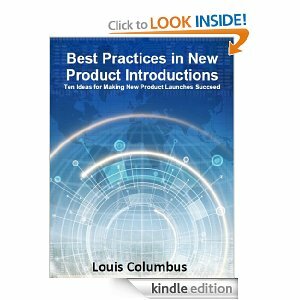 The non-traditional and “Big Data” area of innovation is further supported by content, text analytics, in-memory DBMSs and columnar DBMSs. SaaS-based Business Intelligence is at the apex of the Peak of Inflated Expectations yet will continue to have low adoption rates. Gartner believes that the lack of trust in third parties managing confidential data, and the inertia and fear many companies have in moving to a new architecture are slowing adoption. This is in contrast to the survey Forrester released this week showing analytics being one of the most popular SaaS-based applications planned by 2013 in their base of respondents. Gartner sees SaaS-based Business Intelligence of the most value to midsize and smaller organizations who lack IT staff yet have very specific, targeted information needs. Website analytics, social media monitoring, dashboards, predictive analytics and Excel as a BI front-end all apply. Both Forrester and Gartner agree on this point and see this type of custom development going away quickly internally. There is a massive amount of hype surrounding in-memory computing, particularly from SAP at its Sapphire conferences . Gartner believes that SAP’s vision of in-memory computing exceeds in-memory analytics to include analytical and transactional processing. As a result, In-Memory Database Management Systems are at the Peak of Inflated Expectations. 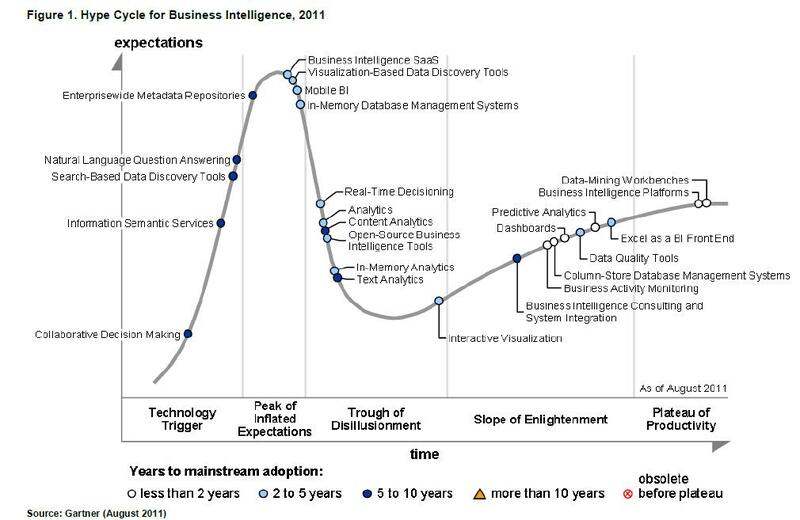 Source: Hype Cycle for Business Intelligence, 2011, Published 12 August 2011 | ID:G00216086 By Andreas Bitterer. Gartner, Inc. The overall market for BI, Analytics and Performance Management continues to grow at between 8 to 12% per year depending on the forecast used. The following forecast is from the report Market Trends: Business Intelligence, Worldwide, 2011-2014, 7 June 2011 | ID:G00213483 by Dan Sommer and James Richardson. 2011 continues to see large, strategic deals for analytics and BI closing more rapidly than they have in the past. SaaS-based analytics and BI continues to gain a greater share of spending in midsize and smaller companies. Both also agree that the proliferation of smaller SaaS-based analytics and Bi vendors concentrating on a specific niche have successfully displaced in-house custom development of competitive applications. Trust in the smaller vendor, their track record, customer references and financial viability are what are winning deals for SaaS-based analytics and BI software providers today. The market transition from build to buy is now in full force as budgets become available again. This is key assumption of both analyses and means that smaller, more niche-oriented SaaS-based analytics and BI vendors stand a chance to get new reference accounts and grow, despite a challenging economy.